Description Of Item: In terms of pure sadistic evil, no one compares to Hannibal Lecter. 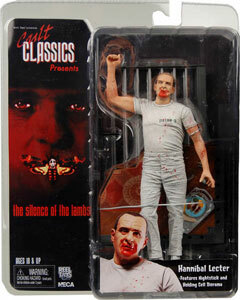 Our new Cult Classics Presents Hannibal Lecter Action Figure depicts the Cannibal as he appears during his horrific, blood-soaked escape in the modern classic Silence of the Lambs. Hannibal comes with a baton and prison cell diorama and hits shelves next month. For now, take a look at Dr. Lecter caged in his packaging. Just remember, once you let him out, all bets are off!